With Obama’s election to the presidency in 2008, many believed the United States had entered a new era: Obama came into office with high expectations that he would end the war in Iraq and initiate a new foreign policy that would reestablish American values and the United States’ leadership role in the world. In this shattering new assessment, historian Lloyd C. Gardner argues that, despite cosmetic changes, Obama has simply built on the expanding power base of presidential power that reaches back across decades and through multiple administrations. The new president ended the “enhanced interrogation” policy of the Bush administration but did not abandon the concept of preemption. Obama withdrew from Iraq but has institutionalized drone warfare—including the White House’s central role in selecting targets. What has come into view, Gardner argues, is the new face of American presidential power: high-tech, secretive, global, and lethal. Killing Machine skillfully narrates the drawdown in Iraq, the counterinsurgency warfare in Afghanistan, the rise of the use of drones, and targeted assassinations from al-Awlaki to Bin Laden—drawing from the words of key players in these actions as well as their major public critics. With unparalleled historical perspective, Gardner’s book is the new touchstone for understanding not only the Obama administration but the American presidency itself. 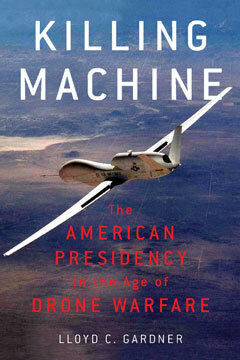 Killing Machine is included in a round-up of "Seven Books on Drones"